"Deposit Bag 9'' X 12'' SafeLok, white w/pocket" product is already in your cart. 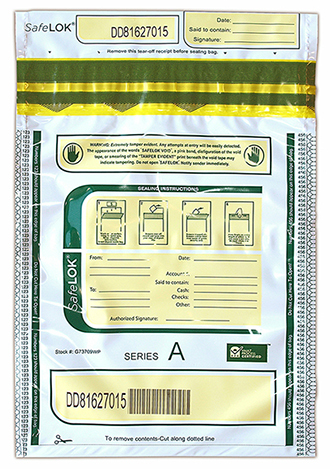 This 9" x 12" SafeLok deposit bag available in high performance white film, includes a external pocket most commonly used for checks and deposit tickets. These bags are secure and easy to use for cash transfers and store deposits. The 9" x 12" deposit bag with pocket will hold 1,000 notes or 1 bundle, and all seams meet Federal Reserve guidelines. This ?easy seal? deposit bag is a favorite for high volume cash users.